Amazon announced its fourth quarter results on February 1, reporting a 30% increase in net revenue to $60.5 billion for the quarter. Driven by its core commerce business and Amazon web services (AWS), the e-commerce behemoth was able to report healthy double-digital growth. Founded in 1994 out of a small garage in Seattle, Amazon grew to become world’s second trillion dollar company. Customer delight, hollowing out retail sectors and disrupting industry after industry, are few practices that are fueling Amazon’s growth engine. With zero experience in the hardware sector, Amazon launched its Kindle e-reader in 2007 which became a game-changer for the company. Amazon Eco, Amazon AWS, Amazon Go, etc. are the outcome of the company’s willingness to move first, test and yes to fail. Data-Driven, Customer-Led Innovation : Amazon is known to use customer data to deliver better customer service. World’s best CEO: One of the biggest strengths of Amazon is their CEO ” Jeff Bezos” . World’s top CEO, Jeff Bezos, has been the backbone of a company which grew from being a small startup to a trillion dollar behemoth. It’s his vision, charisma and ability to execute that makes him stand out from the rest. Strong Brand Name: When was the last time you purchased something from Amazon? It probably wasn’t very long ago. Amazon has become the “everything store” that everyone knows and trusts. 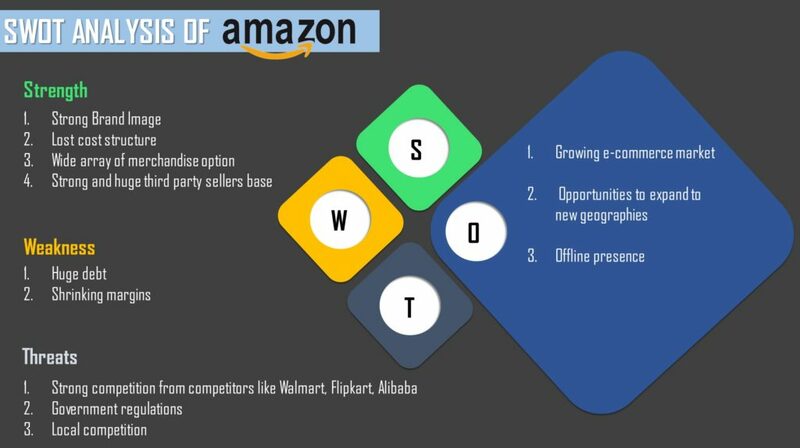 Low Cost structure: Amazon follows cost leadership strategy and it has become one of the major Amazons strength. A cost leadership strategy is where the price may be similar or usually lower than the competition, but costs are certainly lower. It’s Amazon’s massive warehousing facilities and processing capabilities that help it achieve economies of scale which in turn give the company its cost advantages. Started as an online bookstore, Amazon started selling audiobooks, software, video games, electronics, apparel, furniture, etc. The company also has film and television studio, Amazon Studios, manufactures Kindle e-readers, Fire tablets, Echo devices, and is the world’s largest provider of cloud infrastructure services (IaaS and PaaS) through its AWS subsidiary. Company Values: This is a soft point but we feel is one of the biggest strengths of Amazon. Every day, the company asks what it would do to win if it were starting from scratch. It’s the values that are imbibed in the employees of the company that has helped in creating value products/service for the company. Huge Debt: In many developing nations Amazon is still struggling to make the business profitable thereby affecting the overall profitability of the group resulting in Hugh debt. Shrinking Margins: Shrinking margins is one of the main weakness of the Amazon. Tough competition from new and local players like Walmart and Flipkart has led to a price war which ultimately has resulted in shrinking margins of the company. In the war to gain customers, companies are trying to offer products at low prices which is impact their Top line. Competition and Regulation: Threats from competition, both in cloud services and core e-commerce business, and regulation are the major threats for Amazon. Growing E-Commerce market: According to Euromonitor International, E-commerce is expected to become the largest retail channel in the world by 2021, outpacing sales through retail outlets like supermarkets, independent grocers, apparel and footwear retailers, among others. E-commerce will account for 14% of total retail sales in that year. By 2020, E-commerce in the Asia-pacific region will account for 17% of retails sales, followed by U.S and Canada with 16% of retail sales. Expand to new geographies: To scale the business growth, Amazon would need to expand to Asian & developing economies. Not just the e-commerce part, it’s other offerings of Amazon like AWS service, Amazon Eco, Amazon Prime, etc that will help Amazon drive business from these untapped, high potential markets. Increase offline presence: The insatiable thirst of Amazon to challenge the status quo promoted them to add a new leg to their expansion strategy. And this time it was to conquer the retail sector. Slowly and steadily Amazon is moving into the brick-and-mortar retail space with stores for groceries and books. In 2015, Seattle, Amazon launched its first physical bookstore, Amazon Books and is planning to expand across America. In 2016, Amazon opened its first cashier-free Amazon Go grocery store and is planning to 3,000 more stores by 2021. The company didn’t stop till here, they went ahead and acquired Whole Foods in a $13.4 billion deal, allowing Amazon to own 460 stores U.S., Canada, and Britain almost overnight. The next step for the company is to set up stores for furniture and appliances in different parts of America.